New Mexico is getting hotter. It's getting drier. Fundamental weather patterns are changing. The state must prepare for the consequences. Chili peppers are just one of the crops under threat of climate change in New Mexico, as extreme heat and drought cause water supplies to dwindle. Climate change is altering fundamental weather patterns—affecting temperatures, water availability, and weather extremes—that shape the lives of New Mexicans. As a result, infrastructure and resource-management plans designed for the conditions of the past may not meet the future needs of New Mexico's residents. The state needs to prepare for the expected impacts of these climate trends, and would benefit from sustained efforts to mitigate the potential consequences of less water, more excessive heat, and increased losses of life and property from wildfires. New Mexico is the sixth-fastest-warming state in the nation. The average annual temperature has increased about 2.7ºF since 1970. This means earlier springs, hotter summers, and less predictable winters. Precipitation patterns are also changing, with more intense droughts and a greater proportion of precipitation falling as rain rather than snow. Shrunken snowpacks and earlier snowmelts contribute to lower stream flows at critical times of year when the reduced availability of water has greater economic and environmental consequences. Drought and wildfire decrease the soil’s ability to absorb moisture. When heavy rain falls on this affected soil, it runs off instead of seeping down, causing disruptive and dangerous flash floods. The state's multibillion-dollar agricultural sector already faces the effects of a warming climate. Farmers and ranchers are facing higher costs for less and lower-quality water, particularly in the southern part of the state. As drought conditions persist, farmers are pumping more and more groundwater to make up for reduced water allocations from reservoirs and streams. Deeper and deeper wells are needed, and often the water contains higher levels of salt and other minerals that damage crops and contaminate the soil. What's more, higher temperatures and more frost-free days during winter—especially in an already hot and moisture-stressed region—are projected to increase the stress on plants, making them more vulnerable to agricultural pests and diseases. At the same time, New Mexico forests will continue to be affected by large and intense fires that occur more frequently, potentially overwhelming current and past efforts to manage forests in ways that reduce such risks. The fire season in New Mexico has lengthened substantially over the past 40 years—from five months to seven—and fires of more than 1,000 acres occur twice as often. Climate change is increasing the frequency of wildfires, and making it more difficult to recover from their destruction. In 2011, the Santa Clara Pueblo community lost more than 16,000 acres of forested land to wildfire, which cleared the way for heavy flooding the new two summers. New Mexico forests have been ravaged in recent years by drought, insects, and wildfires at a scale not seen in living memory. The piñon pine, New Mexico's state tree, is at particular risk. Severe heat, drought, and beetle infestations caused massive die-offs of piñons in the early 2000s. As many as 350 million piñons dies across the West, with the greatest mortality in the northern New Mexico foothills of the southern Rocky Mountains. 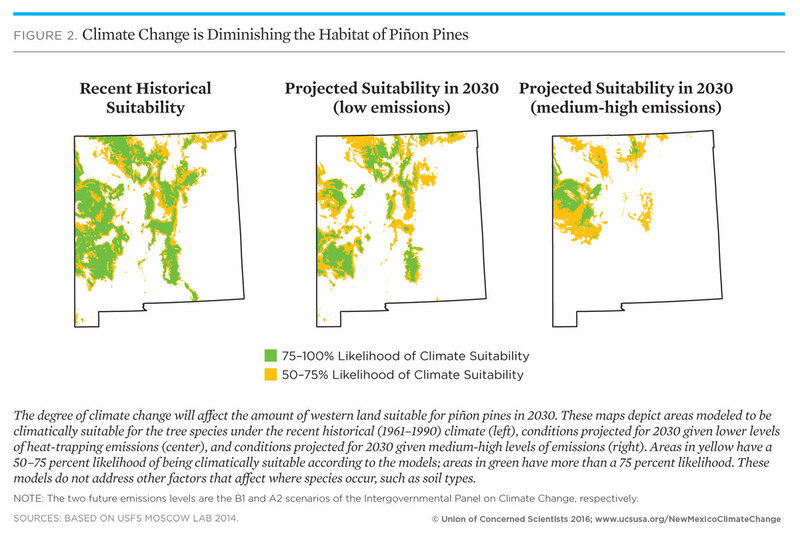 The US Forest Service projects that piñons could disappear from much of their current range by 2030, even if the rise in heat-trapping emissions is slowed. New Mexico can take control of its future through a forward-looking, pragmatic response to climate change—a response that builds resilience to changes already underway and lessens emissions of heat-trapping gases. One of New Mexico’s largest commercial solar PV installations can be found at the Indian Pueblo Cultural Center. This project is a successful example of how New Mexico could increase its enewable energy resources to reduce emissions and build resilience. More than half of the state's CO2 emissions in 2013 came from the electric power sector, which depended on coal-fired power plants to provide 67 percent of total in-state generation. Accelerate the pace of investing in renewable energy and strengthen the state's renewable electricity standard. Manage energy demand through investments in efficiency. Craft a plan to comply with the federal Clean Power Plan. Even if global efforts to reduce emissions succeed, the current levels of heat-trapping gases will cause the climate to warm for decades, making it essential for New Mexico to build its resilience to the effects of climate change. Some New Mexicans are already showing initiative and creativity in the face of these challenges. By taking six steps, state and federal policies should enable and build on such efforts to safeguard communities. Support and learn from communities taking systematic steps to reduce risks from wildfire. Learn and share lessons from water innovators within the state who are working through difficult choices. Make better use of monitoring systems to provide early warning of drought, flooding, or other extreme conditions. Ensure that state regulatory regimes recognize the impacts of climate change on resources and take those impacts into account when managing them. Provide sufficient funding for regional and statewide water planning, administration, and infrastructure designed for the future, not the past. Adopt a groundwater measurement and accounting method that is well understood, broadly accepted, and properly integrated across the spectrum of water dealings. New Mexico has a long history of facing a challenging climate, and New Mexicans have learned to be resourceful and resilient. The challenge today is for New Mexico to take the steps necessary to ensure the future security of the state and its residents.